Launched on the evening of the 2015 Gemmell Awards at Nine Worlds, Legends 2 is a strange beast. Robert Silverberg edited three volumes of Legends, entitled Legends, Legends 2 and Legends 3, but this book, published by Newcon Press, introduced by Stan Nicholls and edited by Ian Whates is unconnected with that series. Instead, being inspired by David Gemmell, they connect with Newcon's Legends published in 2013. Stan Nicholls’ introduction is somewhat revisionist and unconnected to the stories. He suggests that fantasy is becoming more inventive and adopting a more mature message in reflecting modern society. This may be true in some corners, particularly in relation to descriptive content in action scenes, but less so in others, as movements like the New Weird draw their roots from writing that is twenty years old or more and offer more social comment than most current writing in the genre. There is little evidence of new social commentary in the first story The Blessed and The Cursed from Gav Thorpe, which is a formulaic affair littered with inconsistent viewpoint. 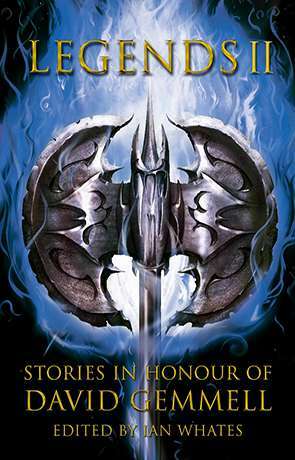 The overly meticulous descriptions of combat distract from the considerations of story and whilst its clear Thorpe is trying hard, he is no Gemmell. Rescue by Mark Lawrence is a much better piece with a clear message about vengeance, but this theme doesn’t live up to Nicholls’ claim. No blame attached to Lawrence here as he delivers a good short narrative with a strong sense of character cut from Gemmell stone as a flawed overachiever. The Lowest Place by Edward Cox continues with the theme of the solitary protagonist and imperfect character. There are some clever trades here as the author experiments with perspective and the mythic quality of his writing shines in a Beowulf-like plot. However, there is a touch too much restraint in places, as the ‘monster’ clearly deserves more of a Grendel persona. The Giant’s Lady by Rowena Cory Daniells is perhaps more of a departure in style from the formula and is a much more delightfully surprising read, with characters, twists and turns that you wouldn’t expect from a Gemmell story. The use of a flawed narrator is an experimental touch and whilst this becomes a little jarring on such a small canvas towards the end, it certainly offers something new. An Oath Given by John Gwynne returns us to more traditional fair. The story is weighted down with exposition, the wordy tone contradicting the character writing and the lack of scene breaks makes the reading experience a little bumpy. However, there is a mythic quality that invokes images of The Thirteenth Warrior, a very appropriate comparison to a Gemmell story. The final scenes, staging combat at a royal feast also, bring us back to Beowulf. The Singer by Stella Gemmell, David’s widow, is a more memorable story of the collection. By far the shortest piece, the mythic quality invoked by a child’s need to finish his song and the other events that become intertwined with it is a vivid image. The juxtaposition of this and Cuchlain’s siege creates connected meaning which the author affirms in the conclusion. The ending invites speculation on how such a connection came about, which makes the story linger long after the book is closed. Sandrunners by Anthony Ryan invokes memories of Gemmell’s Jon Shannow in its setting, but Ryan takes us into a much clearer fantasy. The alchemical magic of ‘Miss Ethy’ and the plight of dragons making for gritty fayre. The story is competently executed, with flashbacks employed throughout. Smokestack Lightning by Gavin G. Smith is cut from similar cloth, but offers a lighter tone by inches. A fantasy involving heist on a paddle steamer involving a jail break, a submarine, Elves, Dwarves, Ogres and Orcs is not something you read every day. Smith’s first foray into fantasy proper shows his range by comparison to other work and this is certainly an attractive commercial work. Oak by Lou Morgan, echoes Gemmell’s earlier novels in the Sipstrassi saga and brings us a mysterious mythic tale. The moving woods of Birnam, Hansel and Gretel and many other old tales are echoed and blended into this piece that brings its own addition to these legends of our past. An Owl in Moonlight by Freda Warrington is an odd story to include in a Gemmell inspired collection. However, the journal style is accessible and instantly warming, providing a nice counter tone to other fayre. The ambiguous ethical twist at its end is also a nice touch. Heaven of Animals by John Hornor Jacobs is a well written zombie story and also draws from the gritty dystopian gunslinger theme. The tightly focused plot and western cowboy parallel makes are good ingredients for a strong story and Jacobs’ writing fulfils their potential, particularly with his choice of conclusion. Iron Wolves: Retribution by Andy Remic ends the collection. It’s a weak story, the character dialogue being a little juvenile and ‘too cool for school’. There are echoes of Beowulf and the Seven Samurai here, but these cards aren’t played as well as they might be. The ending whilst a twist, is also a let down from what has been built up. As an anthology there is a lot to like about Legends 2. Many of the authors have contributed excellent stories and this collection should introduce fans of one writer to the work of another. Written on 23rd October 2015 by Allen Stroud.